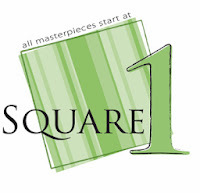 I have seen so many beautiful creations lately done with Square1 Masterpiece. This is the alternative to vinyl and can do everything vinyl can do without being toxic. I did not know that PVC is just as toxic as lead paint. Square1 Masterpiece has been developed to be the safe alternative to vinyl by being PVC free. It is made up of tightly woven fabric and easier to use. The repositionable Square1 has a matte sheen to it; the permanent is a thinner and has a glossy finish. There are now 80 colors to choose from in both permanent and repositionable sheets. The best part about this is that it comes in WHITE PRINTABLE! This means you can design whatever you want in your Silhouette Cameo or your electronic die cut machine of choice and do a print and cut! Amazing! You can use the repositionable Square1 on walls and comes off with ease. Fabulous for renters who are not allowed to put nails on walls........you can decorate with Square1 Masterpiece. Additionally, there are specialty Square1 sheets.....glitter, glow-in-the-dark, dry erase, and inkjet printable iron-on 100% cotton for t-shirts, baby clothes, purses and more! Amazing! Beautiful glass blocks and Christmas/holiday ornaments can be made. The ideas are endless. If you, however, are not artistically inclined, I can always do the work for you! Just let me know what you would like me to make for you! Go to the Square1 website and check it out. You will not be disappointed. Look and see what you can create...your own beautiful artwork for your walls, holiday decor, glass, parties, laptops, floating frames and more! Remember you can use Square1 with most electronic die-cutting machines........all you need is Square1 and your imagination! If you are a crafter and would like to have your own home-based business, we have two Creative Consultant Plans that are available. Your only goal is to buy $100 in merchandise per year (your kit does not count towards your goal). That's it! No monthly or quarterly goals. Plus, you have a wonderful community of Square1 crafters that will help you succeed. Check us out and join us..........let's all go PVC free! !